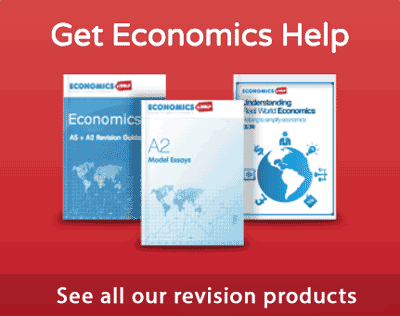 Home > Economics help blog > economics > Who lends the government money? Who lends the government money? Readers Question: Who lends the government money? Government debt is primarily sold to banks, pension funds, private investors and overseas investors. These financial institutions and individuals effectively lend the government money in return for gaining a safe investment (bond) with a guaranteed interest payment. Approx 27% is ‘lent’ by overseas investors. Investors do not see themselves as ‘lending’ money to the government. From their perspective, government bonds provide a relative safe, secure, low-risk investment option. In an investment portfolio, government debt secures the low-risk, low yield aspect. UK public sector debt in Aug 2017 was £1,773.3 billion equivalent to 88% of GDP. 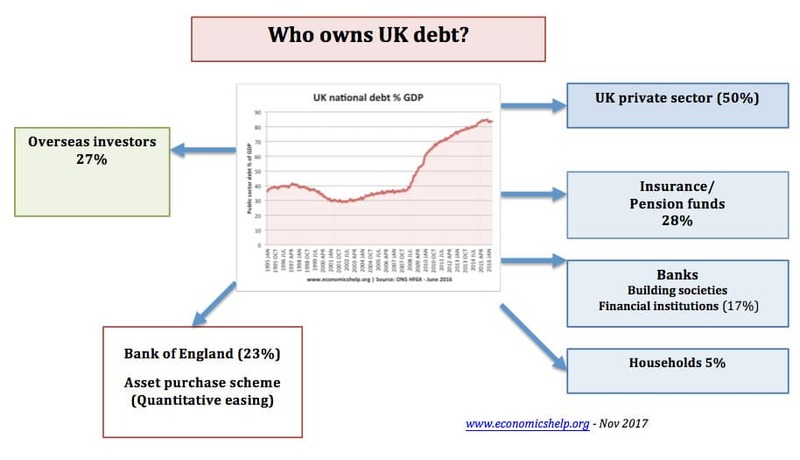 See: UK National Debt. On this debt, the government have to pay interest payments, In 2016/17 this was £49.1bn – approx 2.5% of GDP billion a year. See: interest payments on UK debt. Therefore, the interest payment is paid to those who buy the government bonds and gilts. Since 2008, The Bank of England has purchased 25% of government gilt holdings as part of quantitative easing. 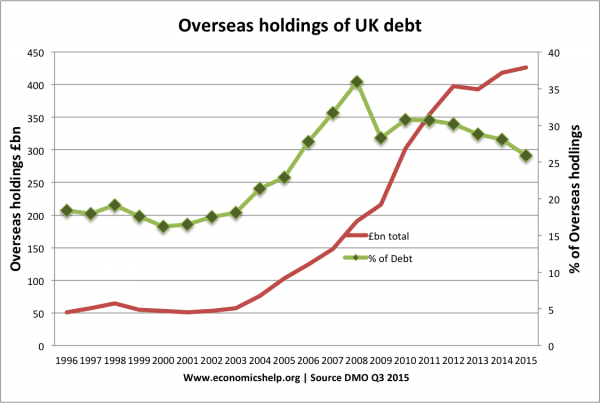 This means a significant proportion of UK debt is being financed by Bank of England. 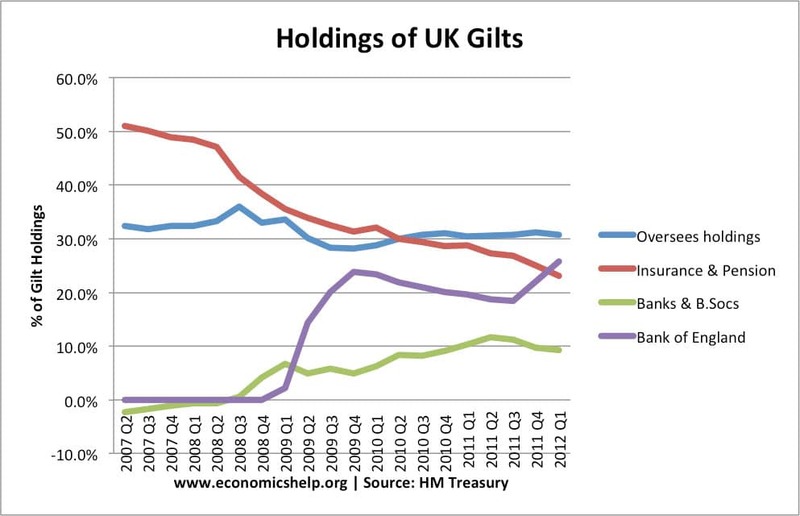 The Bank of England has not taken nearly 30% of gilt holdings. The percent of UK government bonds bought by foreign financial institutions. 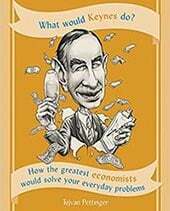 Note: The purpose of quantitative easing is supposed to be – keep interest rates low, encourage bank lending. It isn’t meant as a way of financing government debt. After economic recovery, the Bank of England will sell these government bonds back onto the market. Thus debt will be held by the private sector again. Nobody lends the goverment money, they just take it and write it on our tab. 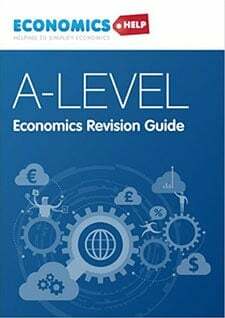 Cash reserves and credit are used (read: money is robbed out of pensions & long term deposits, also known as your savings, that you ultimately pay back after they spend it)) and they bang it on to our tax bills, to complete a “world class rodgering”. Thank you Labor, although I do like a bit of slap & tickle first! 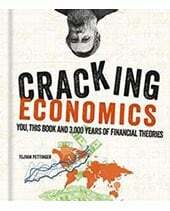 end to all the problems of boom and bust economies that will be the ruin of us all. Geez you Yanks are stupid! The more money you create, the less it is worth. The USA is owned by China Japan, the UK and a handful of rich Arab countries. This is who really controls the USA. It wasnt this way until Bush JR came into power and destroyed the economy and took away all financial control from the USA and put it into the hands of these countries which can afford to bankroll the USA. This is a capitalism fact you all need to get. Central bank is a PRIVATE COMPANY which print money. The government does not have the permit to print money. They need to ask the Central bank to print out money for them. This does not happen in communism country. Enough said. 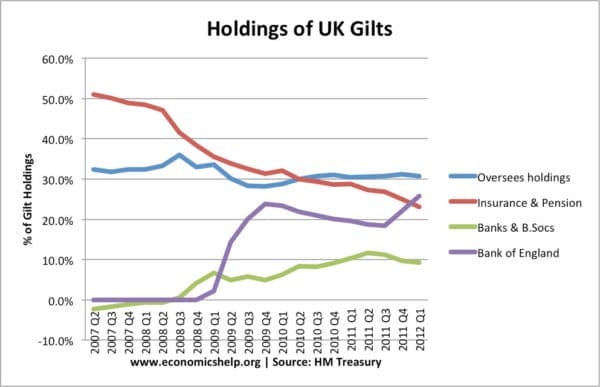 Can anyone explain the precipitate drop in household holdings of gilts? 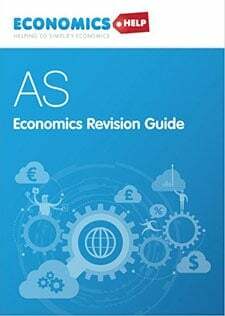 In the UK’s experience, at least, it appears to be related to policy of Quantitative easing. There’s some graphs here on holdings of UK gits. 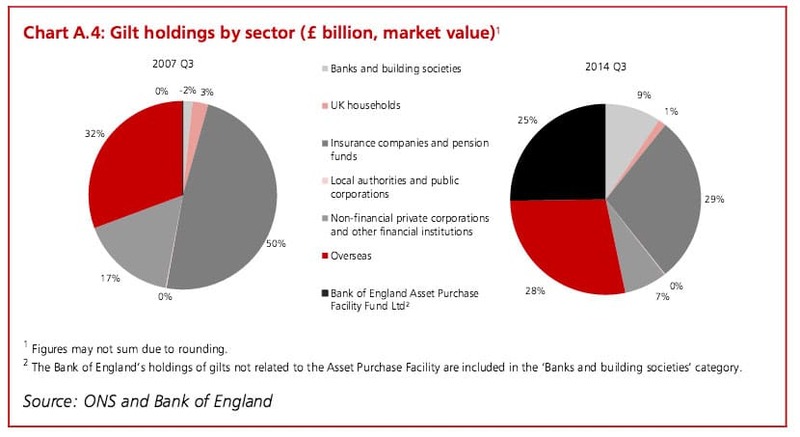 The Bank of England has gone from 0% of gilt holdings to nearly 30%. Banks are holding more gilts (due to not wanting to lend). But, pension fund and investment trusts’ share has fallen from 50% to 25%. Bear in mind, the government is borrowing more. So private investors are still holding bonds, but their share is falling. Until a few years ago, the surplus in the ring fenced National Insurance Fund was invested in Gilts. Since then the surplus has been managed by the Debt Management Office (part of the Commissioners for the Reduction in the National Debt – CRND) and directly invested with the government with lower holding and transfer costs in Call Notice Deposits. The surplus has been as high as over £50 billion in 2007/08 but has fallen to around £40 billion in 2012. I am not sure how that had been classified when it was held in Gilts but it isn’t invested in Gilts any more. my guess is, the reason interest is charged at-all, is because no one actually expects to get the money they lent back again, so interest payments make up the difference. Secondly, the UK does not want to get a reputation as a weak economy, because that would increase the interest rate it has to pay to borrow money. It is the same as an individual trying to take out a loan from a bank: if the bank is absolutely confident that the individual has enough money coming in to pay back the loan then it will charge a much lower interest rate than it will for somebody it is a bit less sure about. basically interest is charged because to a greater or lesser extent the lender isn’t expecting to get the money back. One important point that that throws a spanner in the works. The bank of England is buying ever increasing government debt in the form of guilts. And yet the The Bank of England is wholly owned by the British government! This is shunting part of the national debt sideways. Nothing is being reduced or payed off, it has been moved to a different ledger within the same system. I know it sounds stupid but why not? whats stopping them!